Whether you're a studio owner or a yogi who practices at home on the weekends, our Striped Traditional Mexican Yoga Blanket is a perfect yoga accessory. Use a yoga blanket as a prop for seated poses, or to cover up for warmth and comfort at the end of yoga class. These blankets are soft and durable, and have a slightly tighter weave than our Traditional Mexican Yoga Blanket. The blankets feature bright, traditional Mexican colors, with white tassels on each end. These beautiful blankets are machine washable. PLEASE NOTE: Tassle colors vary from whites, naturals, black, and grays. We want you to be completely satisfied with every item you purchase from us, which is why we offer a 30-day ''No Questions Asked'' money back guarantee on this product. Please see our return policy for details about returning merchandise. Please note that colors may slightly differ on these blankets and therefore are not guranteed to be exact from one shipment to another. I inadvertently ordered three blankets and was prepare to return two; however, I liked them so much that kept all three blankets. I purchased the blue and like the richness of the color. The quality is good -- not too thick or too heavy. It is actually a cozy blanket with multiple uses. A blanket for shavasana contributes that extra support to sink into bliss. These lighter weights are perfect fir summer. 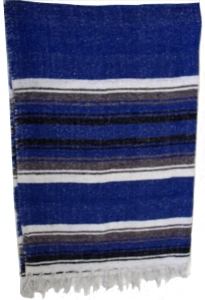 I researched these type of blankets before deciding on Yogaaccessories.com. This blanket is a lovely. thick, well made. It has been a great addition to my yoga practice. This one is maybe slightly less bulky than a traditional yoga blanket but I found it to be a beautiful true red, not like the picture which appears more burgundy. I love the blanket, it's soft and mine does not shed. This blanket is heavy, warm and soft. The colors do not run when they get wet and I have experienced no lint issues with it. The red is a beautiful red, bright and cheerful. Review of "new solid traditional mexican yoga blanket"
I purchased 4 of these blankets so that I could have at home for my restorative yoga practice. I bought this particular blanket bc it was the most affordable one and because it said it was "solid". Now, by "solid", I thought this was a firm blanket, but it isn't. It's not even close to the ones we use in yoga studios. Also, small pieces of the fabric are coming out, which makes a bit of a mess when I'm practicing over my red carpet, as I always have to sweep the floor after I use this blanket.